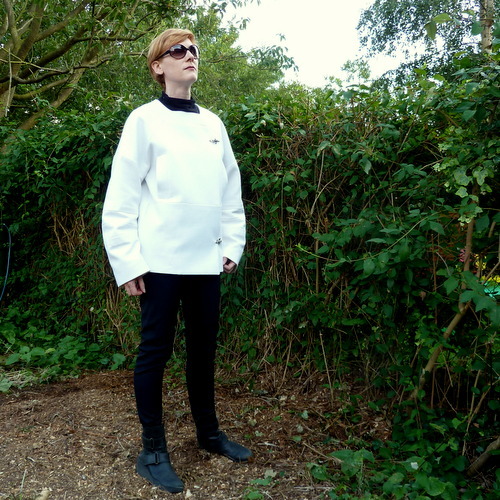 I like space clothes: the sort of thing BBC costume designers came up with for 70s and 80s scifi shows. Vogue 1335 definitely fits the description. Unfortunately we don’t have a post-apocalyptic wasteland round here to use as a backdrop for photos, so my garden will have to do. Finishing this project coincided with one of the UK’s rare heatwaves. 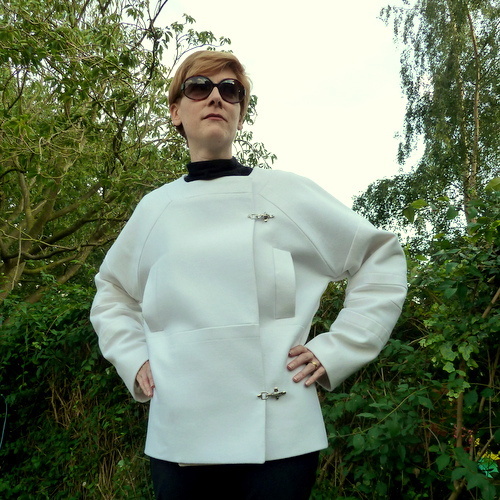 I’m wearing this with my Vogue 1378 neoprene leggings and a black wool jersey top derived from Burda 122-4-2011. And I’m melting. 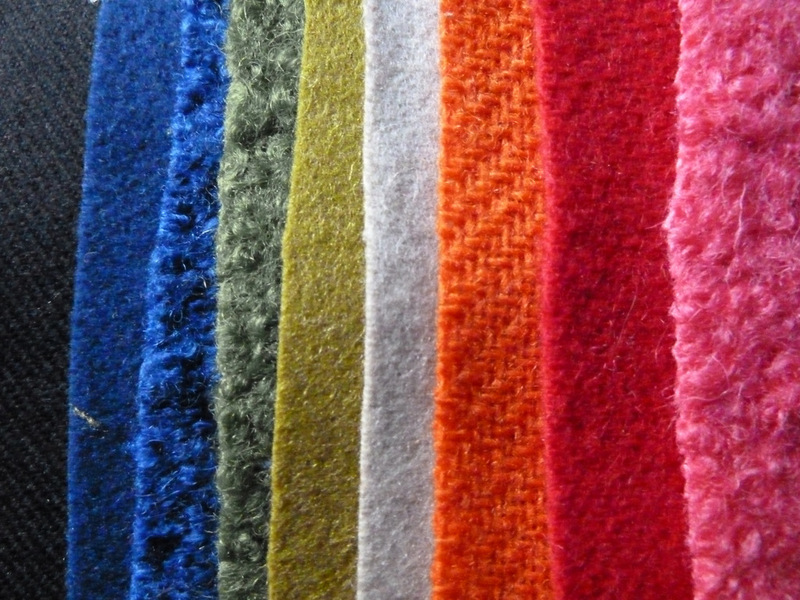 The jacket shell fabric is wool. Here’s the back. It holds its shape pretty well. The diameter at the waist is actually greater than at the hem on this design. 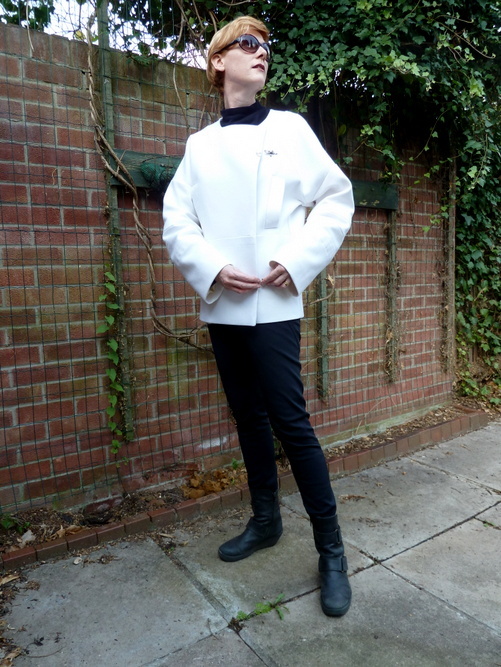 This is meant to be an oversized style but the sleeves in particular are very long. I added the usual two inches to the length that I always do with Vogue patterns and ended up removing it again. I also added two inches to the body length, which again I normally do, and that was about the right amount. The pockets are very roomy. They’re pretty high upon the body, but I think it works with the design. The fasteners are a little bit fiddly! I’m glad I didn’t need the internal snaps that were on the pattern as well as external fasteners. 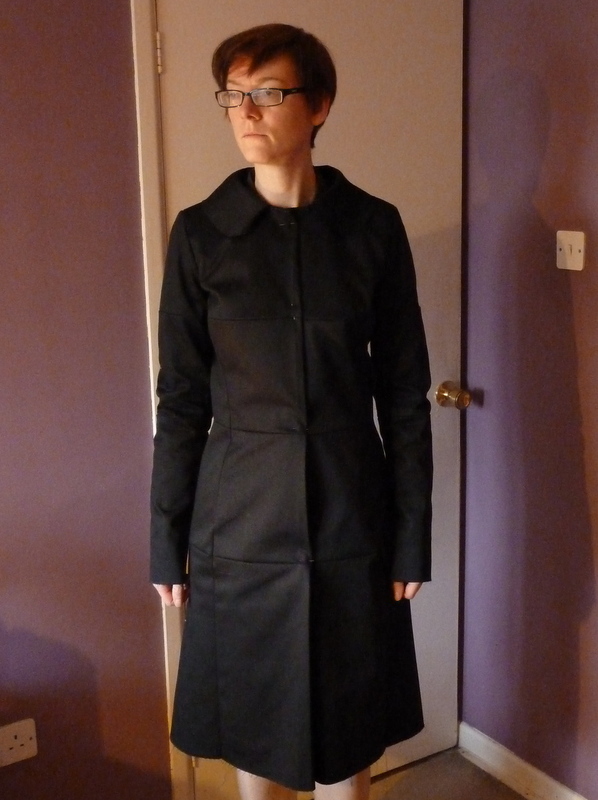 Not such a good picture of the jacket, but I like the Doctor Who monster pose. 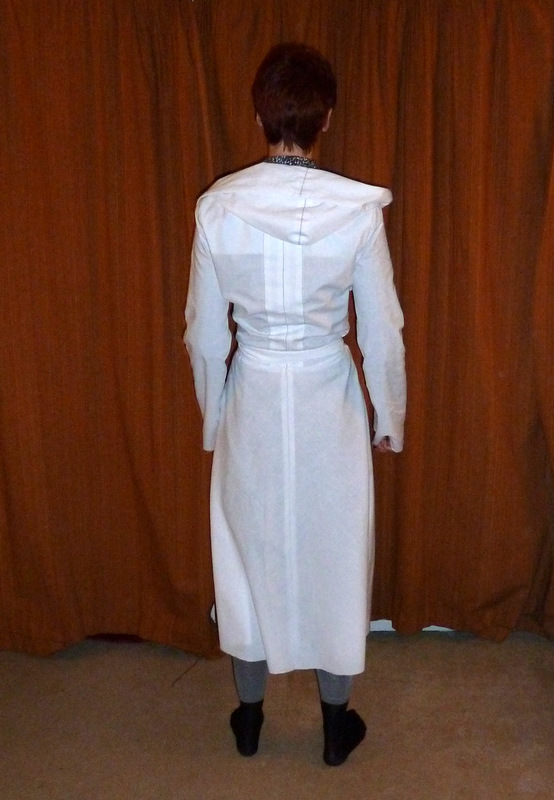 And it’s about the only shot I have where any of the lining is visible. 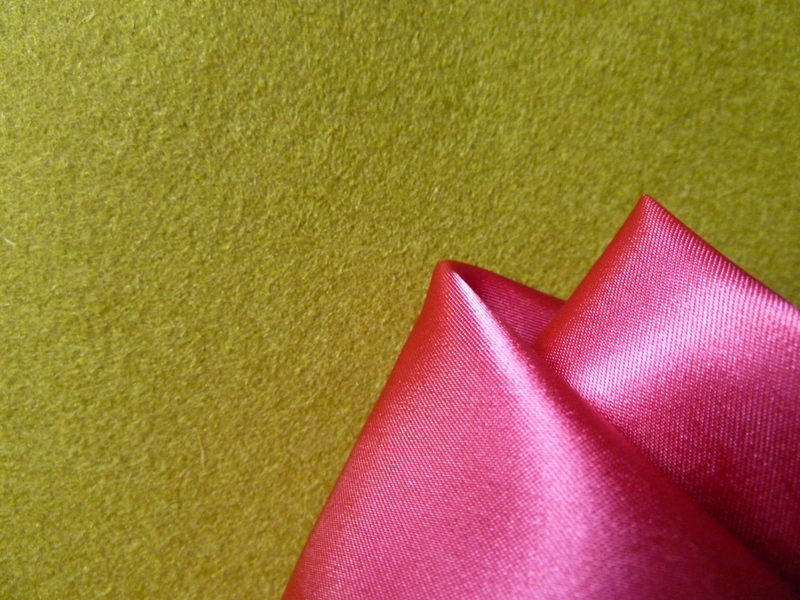 The lining fabric is a heavy poly satin that just adds to the insulation factor. So there it is. I’ll have to wait until the end of summer to wear this for real, but I’m really pleased with the result. I remember being told as a child that ‘we must suffer to be beautiful’. Well I hope my new coat is going to come out beautiful. It’s certainly causing a little suffering right now! I am sparing you a photo of my left hand, which currently sports an iron burn and several nasty pin scratches. Also I will not show you my right ring finger, which I managed to stab deeply with a needle while sewing the pockets on. I’m pretty sure I didn’t get any blood on the coat. It would show on this fabric. So here’s where we are so far. Body sewn, collar and pockets attached, sleeves sewn but not set in. I totally forgot to add a hanging loop when I sewed the back facing seam. I am not going back and unpicking it. 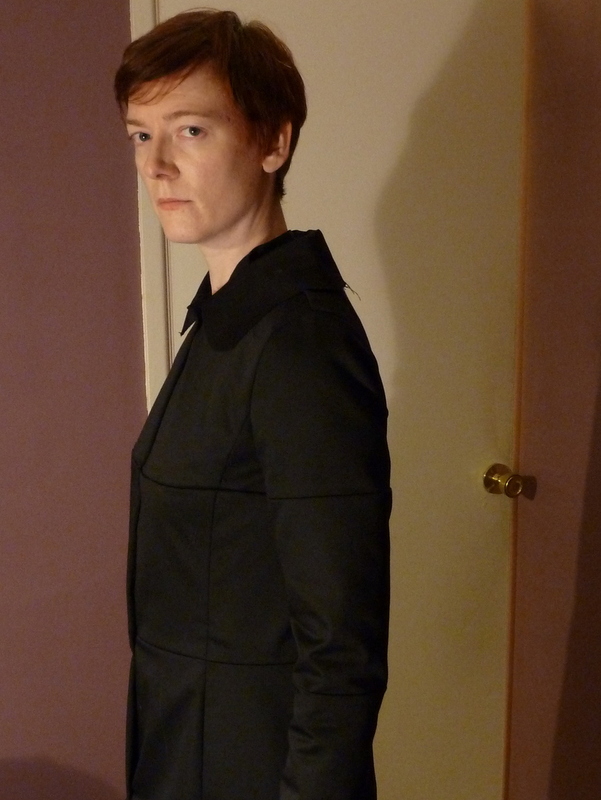 The pockets aren’t perfect but I hate hand-sewing with a passion so they’re not getting a do-over either. 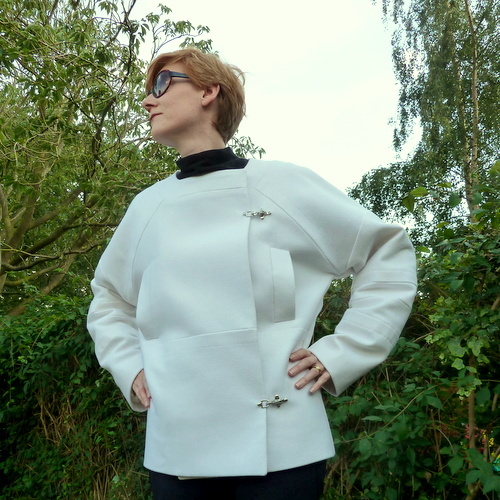 I was worried about sewing through all the layers around the collar but my machine coped with it without so much as a wobble. Look at all those thicknesses! It’s not all bad. I’m pleased with the way the corners came out at the front. Sometimes you turn out a point and it just goes perfectly with no need for poking. Both corners did that; I wish I knew what I did to make that happen! And I still love the style. I think when it’s done I’m going to really enjoy wearing it. Hopefully the blood sacrifice will make the rest of the project go a little more smoothly. I’m about to set the sleeves in; wish me luck! 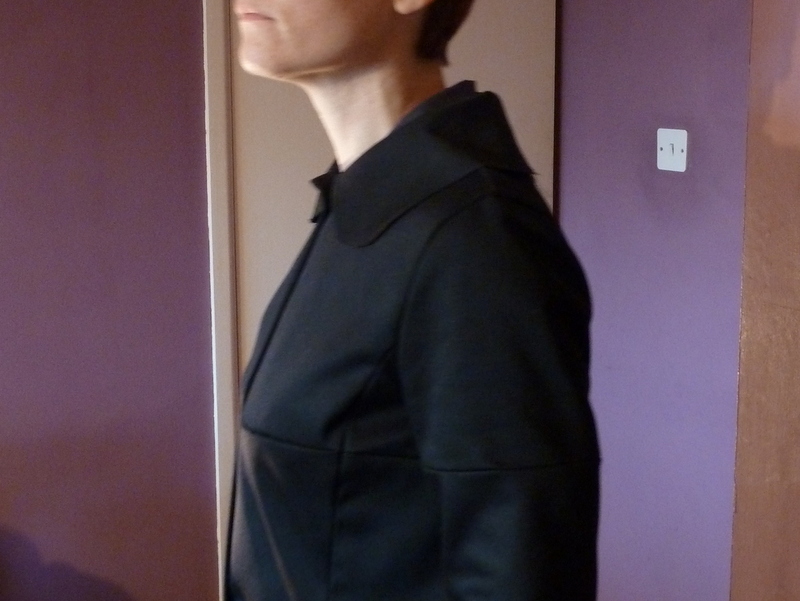 The coat project rumbles on. But something far more exciting happened that I want to tell you about first: I was interviewed by Joanne of Stitch and Witter! 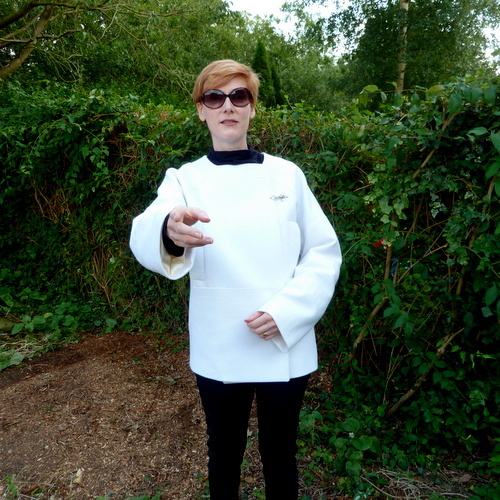 She’s been doing a series of interviews with sewing bloggers about their personal style. I’ve been realy enjoying reading it, and I’m so flattered to be picked. 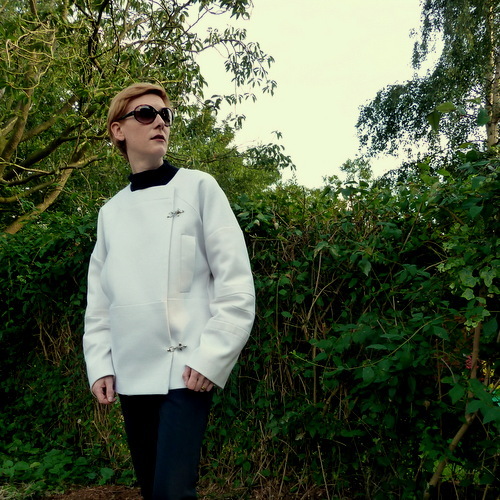 I love reading about how other people dress themselves – or maybe I should say I’m incurably nosy. 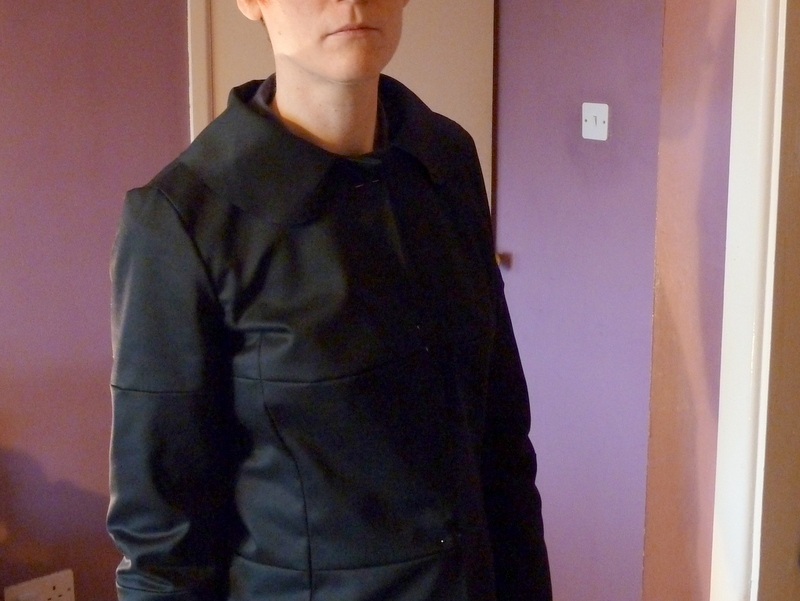 My interview’s at http://stitchandwitter.com/2012/11/22/my-handmade-style-catherine-daze/. You can read Joanne’s whole series here. So on to the coat. I had a major change of mind about it; specifically the fabric I’m using. Here’s the technical drawing. The original was made up in plain white wool which looked fantastic. I liked the very stark, plain effect with just the seamlines for interest so I knew I’d want to use a solid-coloured smooth-faced fabric. Sticking with white would clearly have been insane because it doesn’t suit me and it would need dry-cleaning every five minutes. Besides, I have never seen pure white wool coating on sale anywhere. The green fabric came in a pack of samples from Stone Fabrics and I fell in love with the colour. Here it is with the pink lining I got to go with it. But I’ve been having major doubts about this project and I think I’ve finally worked out why. I think all I am going to see on the finished coat is the green. The style isn’t bold enough to stand up to the fabric. I think the fabric would work as something short and dramatic like Colette Patterns’ Lady Grey though. That’s a pattern that’s been lurking on my to-sew list for some time. So I’m making the Burda coat up in this fabric instead. It’s a stone coloured woven wool coating with a very slight nap. From the right side you can’t see the weave at all. I included my hand and the paper pattern in the picture to give a better idea of the colour. Once I decided to switch fabric and use the green for Lady Grey I started feeling a whole lot better about the original project. 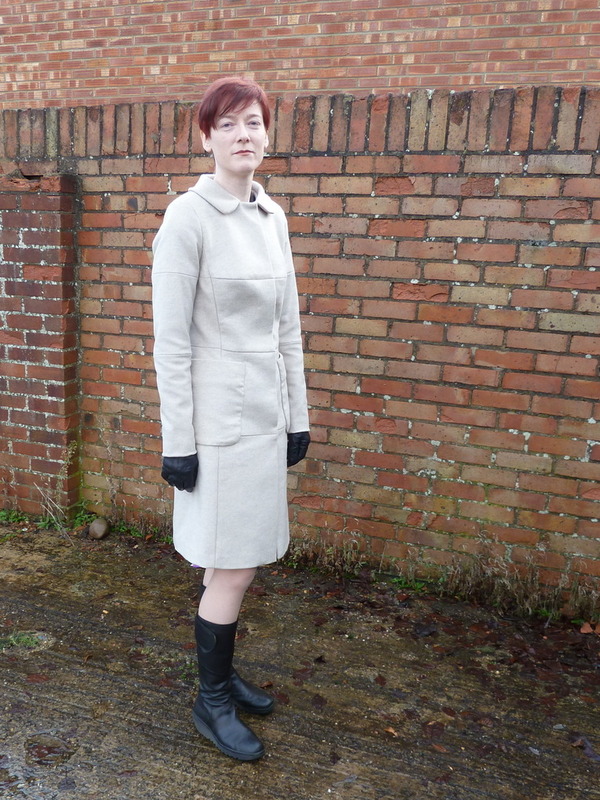 So I am going to end up sewing two coats this winter after all! 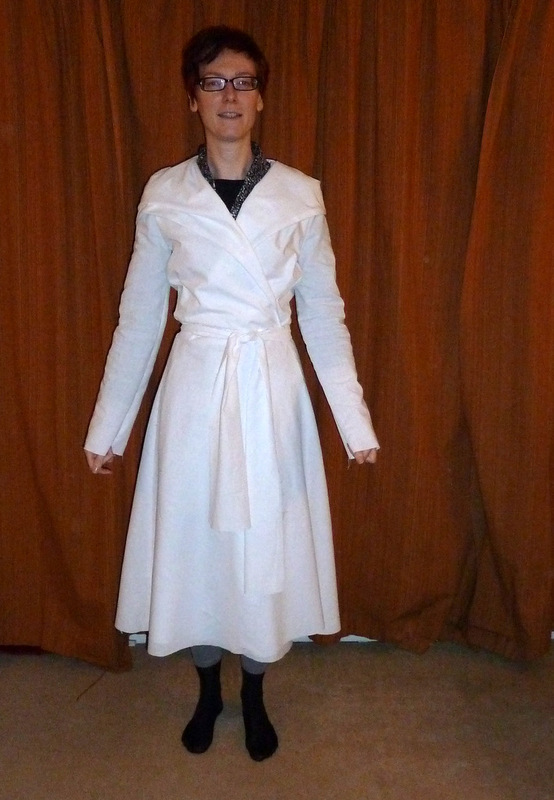 Thanks for all the good fitting advice on my coat muslin. I was all set to call it good enough and start cutting my fashion fabric, but you convinced me to go back and have another go. The previous problem I had on the front was horizontal folds on the princess seams. ozviking, Lisette, Claudine, BeccaA, and maria all suggested shoulder pads so I took myself down to John Lewis to pick up a pair. I had no idea there were so many types! I picked a pair labelled ‘small’ with a picture of a set-in sleeve on the packet. No idea if they’re the technically correct sort, but they definitely help. I’ve also taken out a bit of length above the bust seam here as Beth suggested . 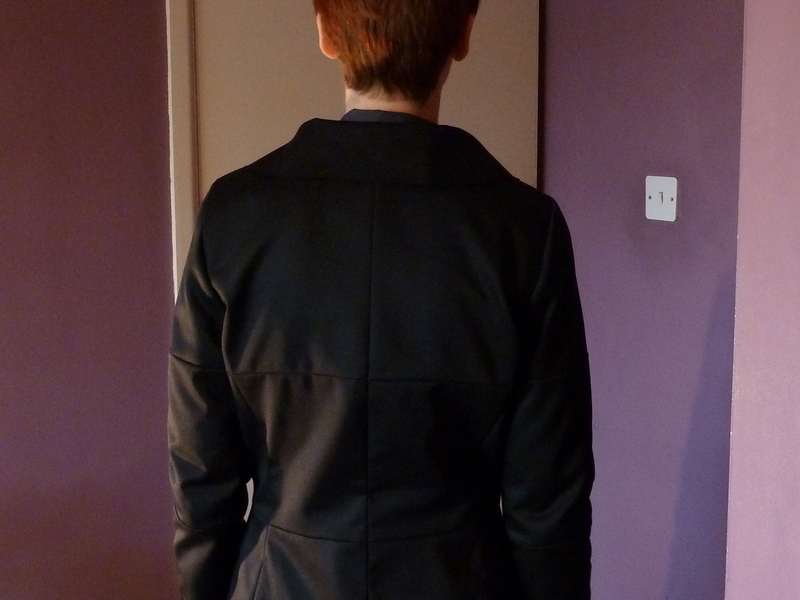 Here’s the back view with shoulder pads, a tiny bit of width taken out of the centre back seam, and again with reduced length above the bust seam. (Can I call it a bust seam when it’s on the back?) Clio and Beth both pointed out that the back seemed too wide to start with. 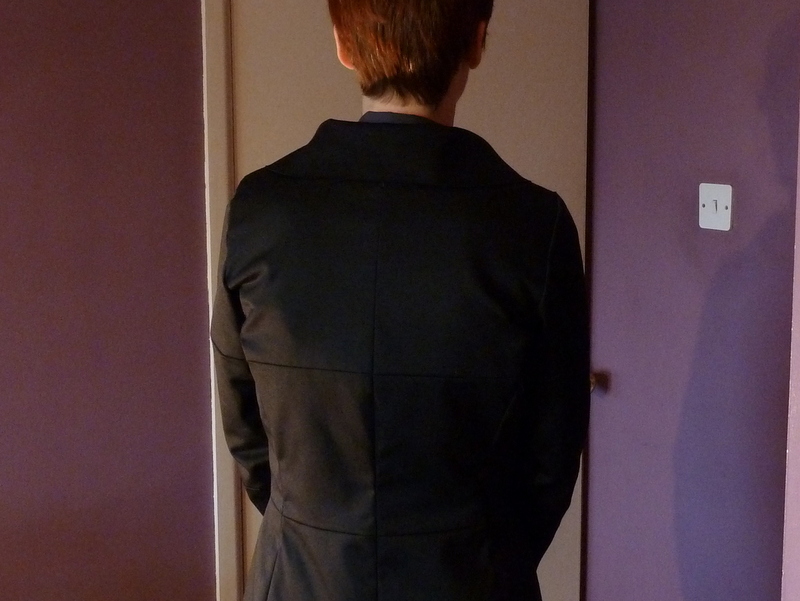 There is still a very small fold of fabric at the back shoulder but it’s really improved. I don’t want to risk trying to get rid of absolutely all the excess, I think I need some of that room to move! The bust seam was rising up slightly at centre front so I let it out a little there, tapering back to the previous seamline before hitting the princess seams. That’s made a bit of difference. The waist seam’s still rising up in front and falling slightly below my natural waist in back so I’ll adjust that in the same way as I did the bust seam. 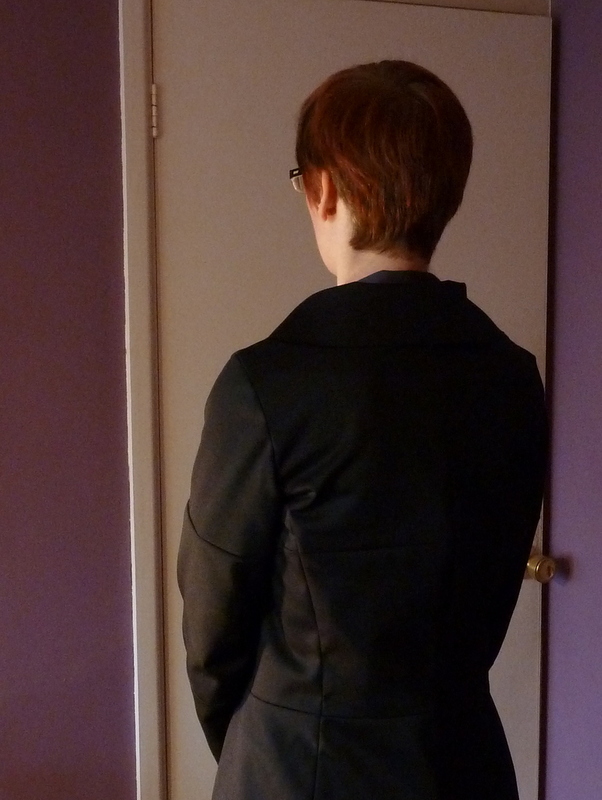 Not that you can see the back waist seam in this picture. I’m regretting using black fabric for fitting! It’s not just the photos; it’s quite hard for me to see what’s going on too. This really has been a learning experience, thanks so much everyone! Well I took the plunge. Armed with everyone’s good advice from my last post I put on some music and sewed my coat muslin up, a few seams at a time. Doing it over a few sessions wasn’t too bad. Thanks for all the encouragement and advice, it really helped! It’s come out pretty well! The most important thing is that I can move my arms, despite having removed all the ease from the sleeve cap. I seem to have forgotten to take any pictures of that. In passing, isn’t it great not to have to keep getting undressed to try a garment on? I did wonder if I should be putting on more layers to simulate a really cold day! 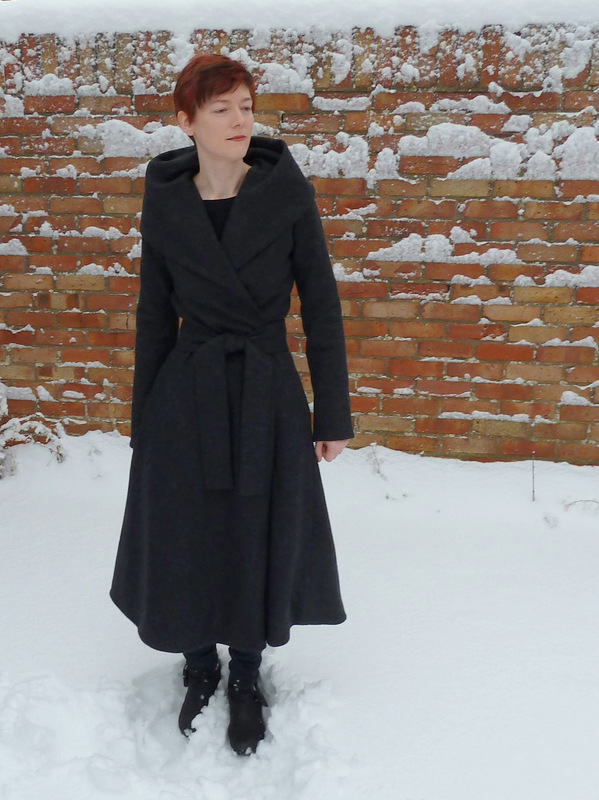 However I am wearing several thin layers and a very bulky belt under the coat in these photos, which is my normal winter work wear. I guess if the coat goes over all that then things will be OK. I had a hard time deciding what, if anything, needed adjusting. Every time I move the wrinkles seem to move as well, and most of them don’t match up to anything at all in my fitting books. The most obvious problem is a wrinkle on the front princess seam. That one doesn’t come and go. I think this is due to excess length above the bust point. I took out a tiny amount – about 5mm – above the seam and things are somewhat improved. 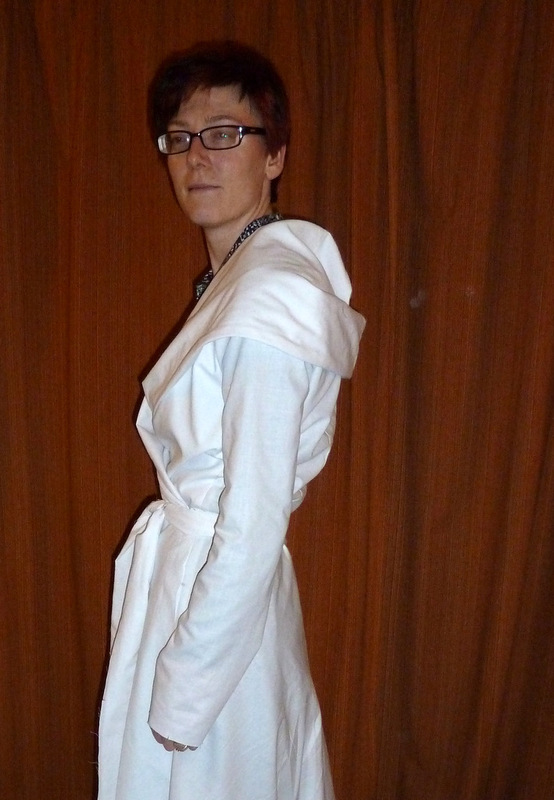 I think I need to take out a little width from the seam as well, but on the other hand I don’t want to overfit things. 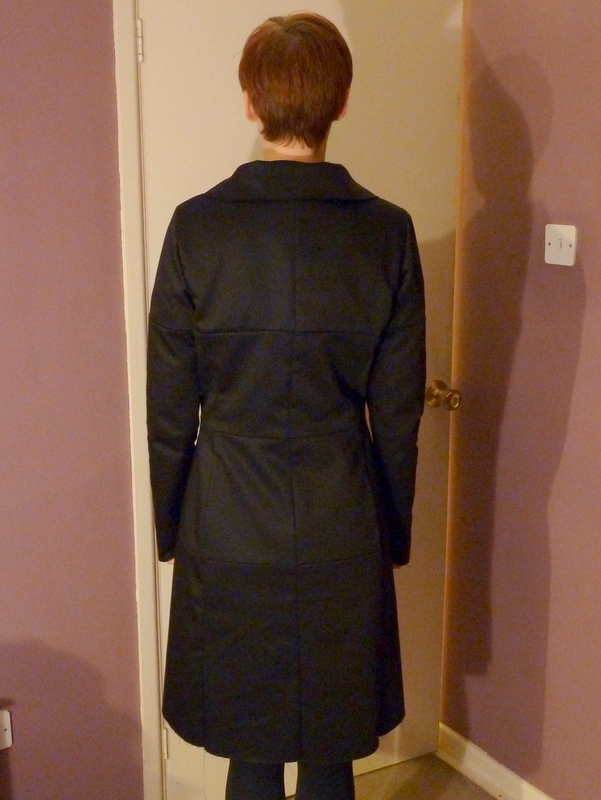 I measured the pattern and this style is unusually close-fitting for a coat. It looks like it needs a full bust adjustment in this picture (taken after taking out the length) because of the way the horizontal seam is rising up and there’s a wrinkle pointing from the waist to the bust point, but I can’t see the problem from the front or in the other pictures I took. Also if I take a pinch of the fabric over the bust there’s actually lots of room there. This is why I find fitting so confusing! There’s a similar problem on the back, only more so. But I think I need some of that extra fabric for mobility, because look what happens when I put my arms forward. The excess width vanishes and there’s just a bit of extra length. I’m just going to take out a little length at the back underarms as well as at the front, and stop there. I picked my muslin fabric because it has a similar (lack of) drape to my shell fabric, but the shell fabric is substantially thicker so I guess it won’t make up quite the same and there’s no point worrying too much at this stage. Wish me luck. Summer’s definitely over in my part of the UK. The schools have gone back for the autumn term, the nights are drawing in rapidly, and I even needed to get my winter coat out one evening last week. I’m sorry the summer’s gone, but on the other hand I really prefer the autumn and winter seasons for all things fashion and sewing-related. Look at these gorgeous coating fabric samples that came from Stone Fabrics last week. I wasn’t planning to make a coat, but now I’m wondering if I can carry off that chartreuse colour. I’d love to use the bubblegum pink, but I just dyed my hair bright red again. I have several great coat patterns in my stash. 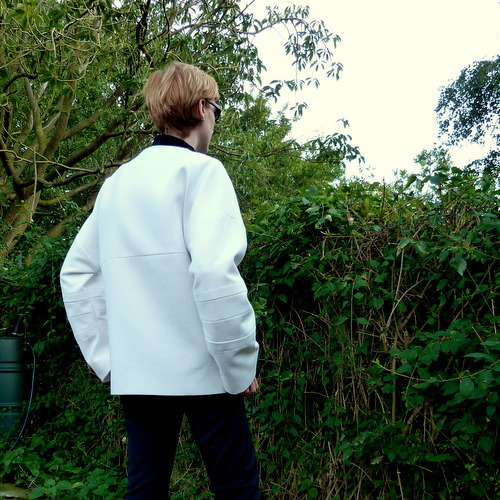 Could I possibly find time to make two coats? 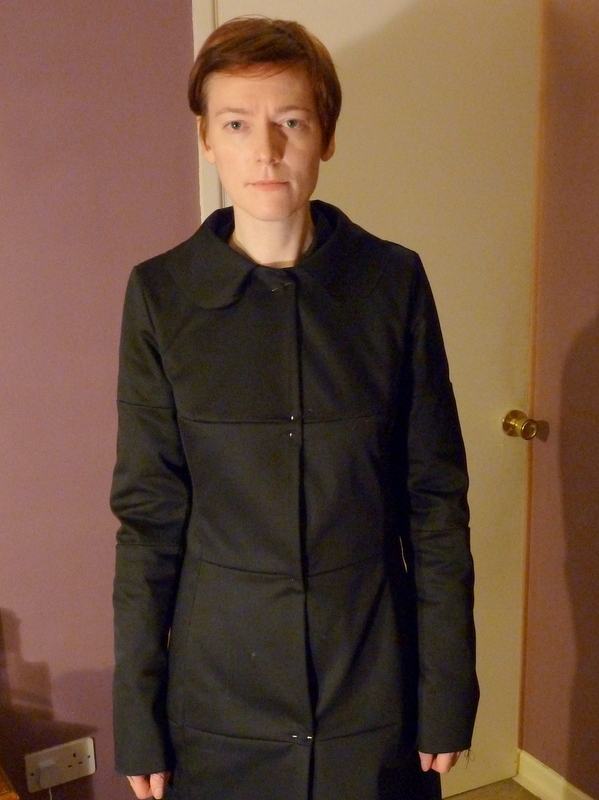 Here’s my new coat, Vogue 1276 by Sandra Betzina. Here’s the pattern envelope photo. And this I found while browsing on Net-a-Porter. It’s from Rick Owens Lilies, one of my favourite lines. While strikingly similar it’s not quite the same style. The Vogue has a much fuller skirt and lacks the extra-long sleeves. But it has all the features that appeal to me in the Rick Owens coat. Pure serendipity! My husband’s first reaction to my muslin of Vogue 1276 was to proclaim “You should not have come back, old man!”. I’m not entirely sure if it was Obi-wan Kenobi or Darth Vader he was reminded of. 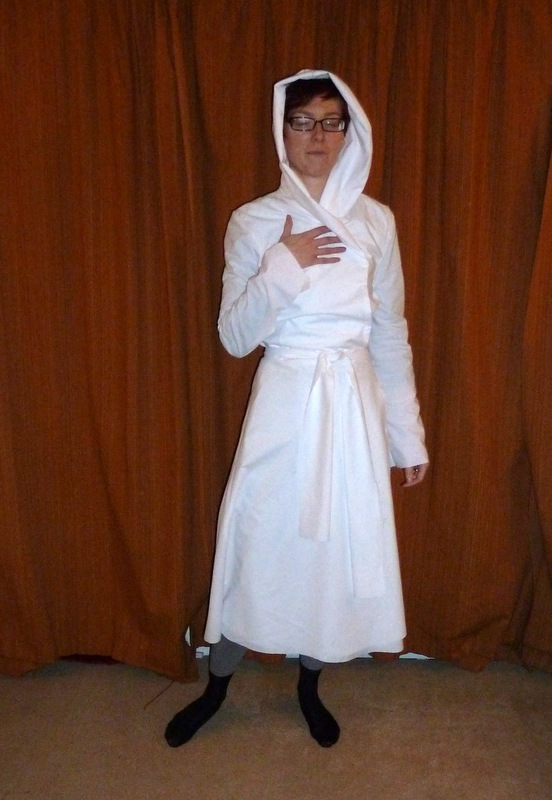 Personally I quite like it – and Jedi normally wear their robes ankle-length, not mid-calf. I haven’t got a picture of the back where the hood is sitting straight. It has a tendency to lie in funny positions when worn down. I can also see I’m going to have to take out all the extra length I added to the bodice. The actual back waist length on this pattern is about two inches longer than what’s given on the size chart. They didn’t match up when I measured the tissue, but the difference was so big I assumed I was measuring the wrong thing and went by the size chart – which incidentally had a slightly different measurement in the version inside the envelope than the one on the back of it. This is the first time I’ve tried a “Today’s Fit” Vogue, but I have to say based on this I’m a “Yesterday’s Fit” girl! I really like the effect when the hood is worn up, and the hood was the reason I chose the style in the first place. I ordered this pattern before Christmas, having fallen in love with the envelope picture. When it arrived I started to have second thoughts. It needs a huge amount of fabric because the skirt is cut on the bias, and the instructions are disappointing. I was expecting something a cut above normal pattern instructions from this range. However based on the muslin I think I shall go on and make this up. 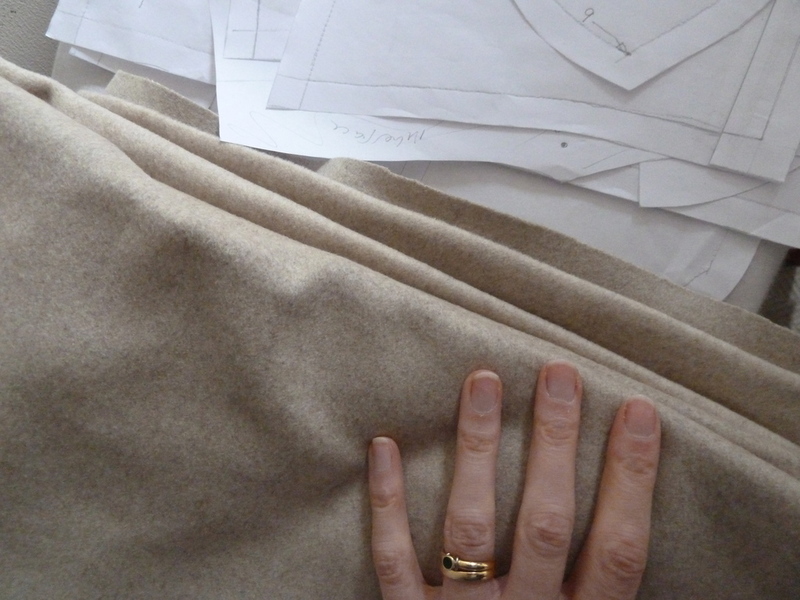 I’ve got a piece dark grey boiled wool from Stone Fabrics that might just be large enough. And by the way, I’m afraid I haven’t been leaving many blog comments this week. It’s not through lack of trying; I’m suddenly having real problems commenting on Blogger blogs. The word verification always comes back incorrect. I’ve even been to look on Blogger’s Known Issues page and there’s no help there. So I’m not ignoring anyone on purpose, just hoping this gets fixed soon.